I live by that old Boy Scout Motto: Be Prepared. Sometimes I take that to extremes. Well, not exactly Extremes, but I do tend to plan well ahead of current needs. I was asked by a visitor to my kitchen a while back, why do I have a glass full of half dead weeds in my kitchen window? After laughing at the abruptness of the phrasing of the question I told him that it was for a mid morning cuppa. Scratching his head, he went out and sat in the big green chair as I brought a tray of refreshments. My personal big green chair, but that's neither here nor there. You never know when a cuppa is on order. I learned that years ago at my mother's knee around the big white circular table in our kitchen. I had my friend up from Key West, and if anyone has ever hosted someone from Great Britain, you know that they walk in the house and put on the kettle. I wonder often whether that isn't some Pavlovian response to walking in the door or not. Since it doesn't effect me, and he does bring his own tea bags, it's neither here nor there. He also doesn't care for Mint Tea. Silly man. 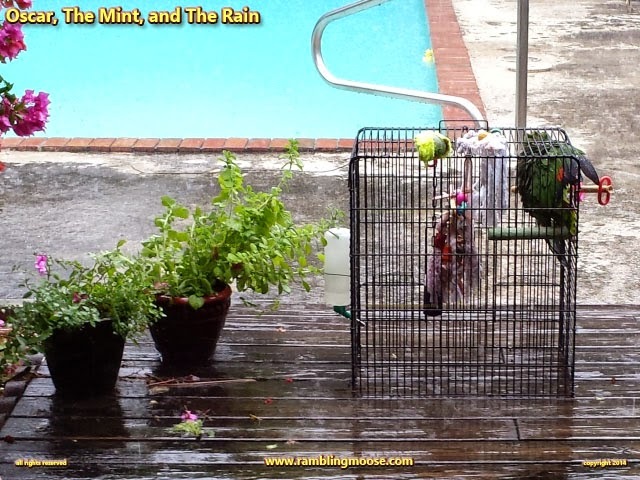 This particular day it was raining, so I told my friend on my big green chair to hold on, and I popped Oscar's cage apart and walked it out to the deck with a cheery "Here, old man, have a shower!". People do like to watch Oscar flap about in the rain, so my friend was standing in the door way attracting Mosquitoes as I nudged past. I also reached over and grabbed a sprig of mint as I was out there and walked back to the kitchen. "Where are you going with that?" "Refill for tomorrow. Be Prepared! May as well, this way it will stay fresh for later!" I dropped it into the glass looking for anything growing in it. Nothing to root, my friend went back out to watch Oscar. "Entertaining old buzzard, isn't he?" Yes, I've known him longer than just about anyone. Besides he doesn't like Mint either. "Here, the kettle is on, have a bit of tea..."